You are viewing the archived 2014 ratings for broadband providers. Go to the current broadband ratings. Reviewed by the Canstar Blue Research Committee for publication on the 10th of April, 2014 . Nearly half of the respondents to our recent survey spend three or more hours every day online in their homes…but are they getting the best digital bang for their buck? We asked Australians who had a broadband plan how satisfied they were with their ISP (internet service provider), and the results overwhelmingly point to one brand in particular: iiNet. Compared to some of our other rated ISPs, iiNet is a relatively young company. Regardless, it has quickly grown to be one of the most prominent providers in the country – not bad for a company founded in someone’s garage. 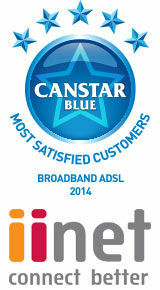 iiNet achieved our Most Satisfied Customers Award – Broadband Providers, 2014. This brand also received five stars for technical support, connection speed, reliability of service, and billing. Our other rated brands had plenty to offer as well. Dodo received five stars for value for money, as did TPG. Additionally, Internode1 received a host of five star ratings for technical support, connection speed, and reliability of service. Optus, Telstra, and iPrimus were also rated in these results. Want to see how each brand performed? Our full broadband provider results can be found below. 1 Internode was acquired by iiNet back in 2011. Canstar Blue commissions Colmar Brunton to regularly survey 2,500 Australian consumers across a range of categories to measure and track customer satisfaction. The outcomes reported are the results from customers within the survey group who currently have a broadband account in their name and pay the bills – in this case, 1,790 people. No matter where you live, and whether or not you have access to the National Broadband Network (NBN), you’re better off getting connected with a provider who more Australians are happy with. iiNet achieved five stars for overall customer satisfaction in this category, edging out four star recipients Internode, iPrimus, TPG, Telstra, and Optus. Dodo was close behind with three stars for overall satisfaction. Some Australians want a broadband account with plenty of download allowance. Others seek out a provider who bundles in a landline connection, or a pay TV options at a low cost. Lucky for all these Australians, there’s plenty of value to be found if you choose the right brand. Both Dodo and TPG achieved five star ratings for broadband package value for money. Next were four star recipients iiNet, Internode, iPrimus, and Optus; then three star recipient Telstra. It’s getting easier and easier to set up broadband without assistance – indeed, 63% of respondents set up theirs all by themselves. However, if things get technical, you may need a hand from the experts. iiNet and Internode customers were most satisfied with the technical help they received from their provider, which earned each brand five stars. iPrimus received a four star rating for after sale service, and Optus, TPG, Telstra, and Dodo each finished with three. There has recently been great debate on the speed of the average Australian’s internet connection. However, until we develop a better network infrastructure to supercharge data speeds everywhere, everyone should ensure their current ISP offers the best connection possible. Both Internode and iiNet tallied five star wins in this category for broadband connection speed, emerging ahead of four star recipients iPrimus, Telstra, TPG, and Optus. Dodo achieved three stars for broadband speed. Outages aren’t unheard of in a country of summer storms and winter winds. Therefore, it’s important for you to partner with an ISP whose service coverage is dependable. Internode and iiNet customers were most satisfied with the reliability of their broadband service. Each brand received five stars; next were four star recipients iPrimus, Telstra, TPG, and Optus; and closing with three stars was Dodo. iiNet finished with five stars for its billing services, and was followed by four star recipients Internode, iPrimus, TPG and Dodo, and then three star achievers Telstra and Optus.